Situated in Love Street, about ten minutes’ walk from the Cross, and form one of the most effective hugs of the town. Fountain Gardens were created grounds originally called Hope Temple Gardens. Hope Temple Gardens were developed by John Love in 1797. He created The Hope Temple Museum along with a bowling green. Love became bankrupt after a disastrous American business venture and the park grounds were sold Thomas Coats in 1866. 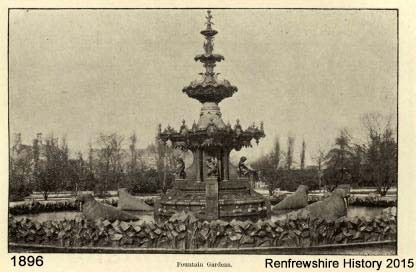 The gardens were opened on the 26th of May, 1868, by Mr Coats’ attended by the Provost, Magistrates, and Town Council, and accompanied by a demonstration of the trades in the town. In the March of the previous year, in the presence of the Provost and a number of friends, Mr Coats planted, in the west end of the Garden, a young oak tree, which had been a seedling of the famous Wallace Oak of Elderslie. The efficient band of the Industrial School performed in the Gardens weekly during the summer months. These gardens with the magnificent Fountain in the centre, were the gift of the late Thomas Coats, Esq. of Ferguslie. They consist of over 7 acres, and cost, with endowment, about £20,000. The fountain was recently fully refurnished and is magnificent when seen.